Food Allergies and Your Child – What Now? Pompano Beach, FL. October 8, 2014 – Getting a diagnosis that your child has a food allergy is life changing – for you, your child and your entire family. Allergic reactions to food can be serious and life-threatening. Did you know that 90% of allergic reactions in kids happen with 8 foods – milk, eggs, wheat, soy, peanuts, tree nuts, fish and shellfish? What is the first thing you should do when your child is diagnosed with a food allergy? Ask the doctor for an EMERGENCY CARE PLAN if they haven’t given one and to learn the signs and symptoms of an allergic reaction. Create what’s called a FOOD ALLERGY MANAGEMENT PLAN. The Balancing Act will air a new series in collaboration with Kids With Food Allergies, a Division of the Asthma and Allergy Foundation of America, to raise awareness around the growing numbers of kids with food allergies and to provide education and support for families. The first segment will air on Wednesday, October 15th at 7:30 am (ET/PT) on Lifetime. The great news is that he Kids With Food Allergies website, with over 40,000 members strong and celebrating its 10 year anniversary this year, is a community offering a wealth of information to all families who are managing a child’s food allergy diagnosis here at www.kidswithfoodallergies.org. Everything is FREE so families can access what they need regardless of their financial means. With 1 in 13 children in America now having a food allergy, parents need to be aware that even if their child doesn’t have one, on average, 2 children in their classroom at school will. KFA is dedicated to raising public awareness and that includes in the schools. 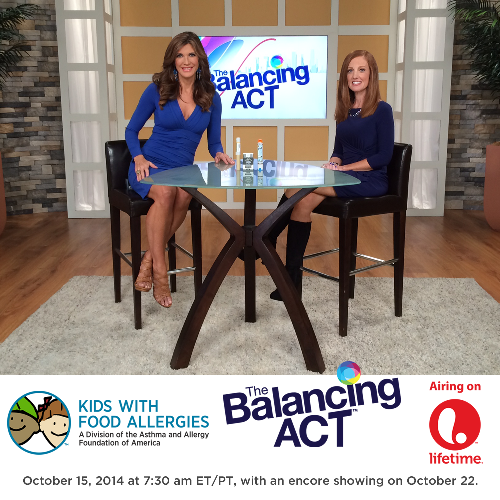 Please make sure to tune in to The Balancing Act on Wednesday, October 15th at 7:30 am (ET/PT) on Lifetime (this show will re-air on October 22nd 2014 at 7:30 am (ET/PT) on Lifetime) as Michele Cassalia from Kids with Food Allergies shares the latest information on food allergies and how you can keep children safe and healthy. And don’t miss part 2 of this special series that will focus on tips for keeping the holiday season fun and safe on Thursday, November 20 and 27th at 7:00 am. © 2014 O2 Media, Inc. All rights reserved. O2 Media and the O2 Media logo are trademarks of O2 Media, Inc. The Balancing Act and the Balancing Act Logo are trademarks of The Balancing Act TV, LLC. Lifetime and the Lifetime Logo are trademarks of Lifetime Entertainment Services, LLC. I have the DVR set!